We employ a narrative approach to focus on collecting and understanding stories of successes and struggles in care receiving, caregiving and decision-making for adults with disabilities as told by adults with disabilities, their caregiving parents and siblings and their paid caregivers. For the current paper, we elaborate our narrative approach by incorporating a complexity inspired approach to emphasize the interactive, co-created nature of messages. We study the voices of adults with disabilities in interactions that include their family caregivers to better understand how views and experiences expressed by adults with disabilities compare with, and are influenced by, those expressed by their caregiving parents and siblings. Our sample is a subset (N = 50) of participants from a broader qualitative study (N = 112) about successes and struggles in caregiving, care receiving and decision making experiences of families of adults with disabilities and/or mental health issues described by adults with disabilities and/or mental health issues, their caregiving parents and siblings and representatives from agencies supporting adults with disabilities and/or mental health issues and their families. Participants took part in in-depth interviews which were semi-structured to support rapport and allow flexibility of the interview structure around predetermined topics of living with and/or supporting someone living with disability and/or mental health issues. We define disability broadly as including Autism Spectrum Disorder, Developmental disability, Down syndrome, Fetal alcohol spectrum disorder and Prader-Willi syndrome. Mental health issues were also defined broadly in the larger study as including mood and anxiety disorders, bipolar disorder and schizophrenia. This study was funded by the Canadian Institute for Health Research and was conducted between 2010 and 2012 in two major urban centres and one smaller community in Alberta. Participants were recruited through newsletters and electronic distributions of a number of agencies providing support for adults with disabilities and their families. Participants were pre-screened by telephone or email to ensure they met inclusion criteria. To be included, family members had to be 18 years of age or older and report that they, their sibling or their adult child have a disability and/or mental health issue. Agency representatives were eligible to be included if they were employed in the provision of support and services to adults with disabilities and/or mental health issues and their families. Family member participants had the choice of interview format in which to participate: 1) One-on-one interview with the researcher; 2) Interview with the researcher along with one or more of their family members; and/or 3) Focus group – with or without one or more family members – which included the researcher and participants from other families. In our endeavor to collect multi-dimensional data illustrative of family dynamics, effort was taken to collect as many perspectives from within each family as possible. Our family member sub-sample for this analysis includes 20 members from seven families all of which include and adult with a developmental disability. Data from these seven families were collected through seven one on one interviews, 3 interviews that included one or more of their family members, and three focus group interviews, with or without other members from their family, that included participants from other families. Our 20 family member participants are all from families from whom we obtained multiple and sometimes simultaneous family member perspectives enabling us to hear different within family views about support dynamics as well as observe these support dynamics first-hand. Our 20 family members include seven adults with disabilities, seven of their caregiving parents and six of their caregiving siblings. Five adults with disabilities took part in an interview or focus group interview with one or more of their caregiving parents or siblings. Two adults with disabilities took part in a one on one interview while their caregiving parent or sibling took part in a different one on one or focus group interview. Family participants are from a range of family structures (intact, reconstituted and adopted; two parent, lone parent and no parent) and include adults who have a variety of disabilities and who range in age from 19 to 71 years. Three families are from a small community and four are from a large urban centre. 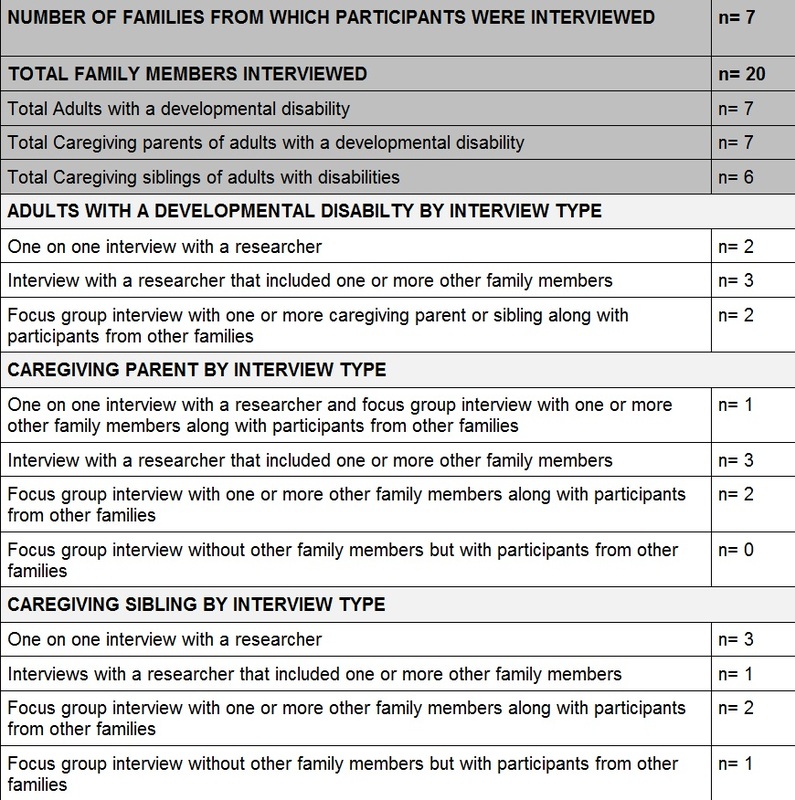 Family member participants are summarized by family position and interview type in Table 1. Our agency representative sample includes 30 participants employed providing support and services to adults with disabilities and/or mental health issues and their families who took part in one of five focus groups. 19 agency representatives are employed in service and support provision targeting adults with disabilities, three are employed in agencies providing support and services to adults with mental health issues and 8 are employed by agencies serving adults with disabilities and/or mental health issues. Two agency representative focus group interviews were conducted in a small community and three were conducted in one of two large urban centres. Agency representative participants are summarized in Table 2. Ethics approval for this study was provided by the Conjoint Health Research Ethics Board of the University of Calgary and all participants signed an informed consent form; adults with disabilities signed an informed consent form and also had a family caregiver sign a surrogate consent form. All interviews were audio recorded and transcribed verbatim. Pseudonyms are assigned to participants who are quoted. This qualitative analysis of our data began with a broad organization of the data achieved through repeatedly listening to interview and focus group recordings and reading the transcripts. Once we achieved a familiarity with the data, we began a thematic analysis by examining what is in the text and giving it a name or code. As per Bruce Berg codes or themes are chosen to “reflect all relevant aspects of the messages and retain, as much as possible, the exact wording used in the statements.” As well as being guided by sensitizing concepts from the research literature pertaining to successes and struggles in care receiving, caregiving and decision-making for adults with disabilities, we examined our data for evidence of “voice” of adults with disabilities and ways in which voice is verbally and non-verbally supported versus obscured or obstructed by caregiving parents. We examined what is in the “text” and what interactions surround particular text. The trustworthiness of our data is augmented by the triangulation of data sources embedded in our design of including multiple views and processes from within caregiving family contexts. We triangulate further by using one on one, group and focus group interview methods with distinct as well as overlapping groups of participants. Thus in our analysis, we compare perspectives within and between families and we compare family perspectives with those of agency representatives. Identification and refinement of themes is shared by the four authors/data analysts working on this project. Themes were regularly discussed via email and face to face meetings, to generate additional or alternate themes, check identified themes against the experiences of analysts and obtain consultation in the case of confusing or ambiguous themes.